Fully noise-insulated irrigation pump sets for water abstraction in locations where an exposed diesel engine running for hours on end is likely to cause a disturbance will be added to Bauer’s comprehensive crop irrigation equipment range at the LAMMA show. 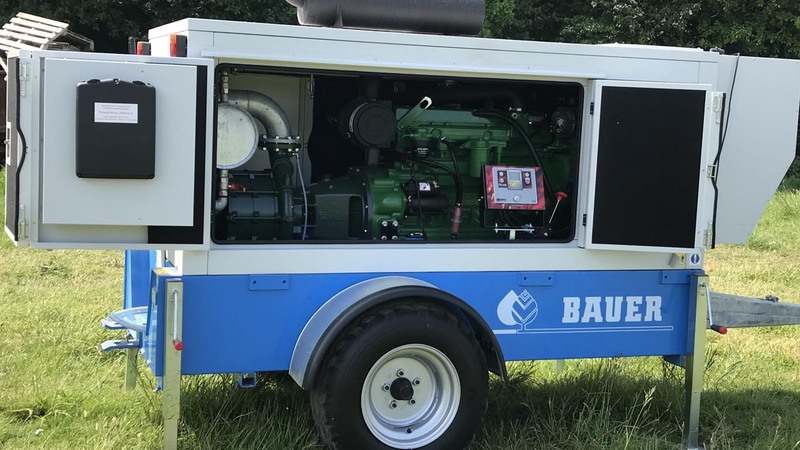 The mobile pump set design offers a choice of engines and fuel tank sizes, has a well-proven pump, and an electronic control panel that can be linked to Bauer’s SmartRain remote control system via an App on a smart phone or other mobile device. Unlike the open canopy pump sets produced by Bauer, the new design has a fully sound-proofed enclosure for the engine, pump and controller, which are accessible via lockable doors. Only suction and pressure hose couplings, the engine exhaust silencer and an emergency stop button are located outside the canopy. The pump set’s two-wheel chassis has galvanised steel mudguards, generous tyres and road lighting, plus four crank handle wind-down stability legs and a removable drawbar for security. It also incorporates a choice of 650-litre, 1000-litre and 1500-litre diesel tanks with a lockable filler camp located within the canopy, to fuel an engine from FPT Industrial – successor to the Iveco engines business – tuned to provide the power and torque characteristics needed for an engine running at constant revs for long periods. There is a choice of 4.5-litre four-cylinder engines from 100hp (74kW) to a 6.7-litre six-cylinder with 125hp (93kW) output driving Caprari MEC MG 80-4/3A and MEC 100HT/2a centrifugal pumps, which are popular units for this application, having been proven in service for many years as an efficient and reliable design with low wear and maintenance demands. This pump is primed manually as standard from the on-board Supertank supply or automatically with an upgrade to the Elcos CIM250 control panel that provides ‘ignition’ key start/stop, a rev counter and hour meter, engine protection in the event of low oil level or pressure or coolant loss, a flow switch connector and pump pressure transducer. The optional CIM136 controller adds automatic engine speed control to maintain water pressure and an integrated modem for remote start/stop via a mobile phone, as well as the potential to remotely monitor, control and receive status messages from the pumpset via Bauer’s SmartRain irrigation management and documentation system. SmartRain enables users of Bauer Rainstar reel irrigator and Centerstar pivot systems to keep track of just one or several irrigators remotely via an office computer or using the free App available for mobile phones and other Apple or Android devices.